Redefining the high end of Light & Sound technology, at an affordable price. With more AVS stimulation sessions, more storage and more new features, the Nova Pro 100 is the latest in what Light & Sound Technology can offer. 100 relaxation, meditation, sleep, learning, energizing, visualization, entertainment and specialty performance sessions, and room for 100 more. Downloadable, two user ready. Includes free Light/Sound Designer software download and Light/Sound Librarian software and additional session libraries which are available to download from this web site. Sessions are organized in categories for easier selection. 100 Built-in sessions - Including the 50 Nova Pro sessions, the 10 quick mood change sessions from the Muse# and 40 new sessions. Download capability - Room for 100 downloaded sessions (or a total of 1000 session segments). AudioStrobe compatible - AudioStrobe* (licensed from Tamas Laboratories) is a registered Trademark of Tamas Laboratories in Germany, who holds the German patent on the technology. Session run time - A session may be run at 1/2 to 2 (in steps of 1/4) times its designed time. The 3 digit display can display up to 4 hours of run time; however, downloaded sessions may be designed to run much longer than this -- the maximum possible run time is over 100 days. Pitch - The Nova Pro 100 pitch is extended two octaves at the low end, to 16 hertz (a total of 14 new pitches). The total pitch range is 16Hz to 960Hz, 6 octaves of the just scale, 7 notes/octave. Also, the pitch 2 relative to pitch 1 mode is extended to cover P1 minus 1 to 15 hertz, as well as the P1 plus 1 to 15 hertz provided on the Nova Pro. The low frequencies have a very powerful effect with the standard headphones, for even stronger effects you can use more expensive headphones. We have used the Sony MDR-V6, available at around $79.00, with good results . Frequency range - Stimulation frequency on the Nova Pro 100 was extended downward by two octaves, from one hertz to 1/4 hertz. There also are three new frequencies, 3/4, 1/2 and 1/4 hertz (only three frequencies, but it is two octaves). Frequencies go in steps of 1/4 hertz through 2 hertz, 1/2 hertz through 10 hertz, 1 hertz through 20 hertz and 2 hertz through 42 hertz. The Schumann resonance at 7.83 hertz is also included. Duty cycle & Phase - Duty cycle control from 1/8 to 7/8 in steps of 1/8 is provided. There are six selectable phasing relationships between the four stimulation channels (two eyes, two ears) in the pulsed tones. Light phase is also controllable in the binaural beat modes. Two user ports - Ports for two simultaneous users (Headphone/glasses combinations are available at a special price for the second user). The drive circuitry handles the second user with no degradation from one user performance. Four system control choices - The Nova Pro 100 synthesized stimulation can be controlled by a selected built-in session or downloaded session, manually from the keyboard, or remotely via a COM port connection from a computer. When the system is in manual mode it accepts commands from both the keyboard and the COM port. Ramps - (gradual changes in frequency and pitch -- yes, we ramp pitch) can now be commanded in the manual mode, from the keyboard or the COM port. Specify a ramp time (up to 10 minutes), specify the target frequencies and pitches (two of each in the dual binaural beat and dual monaural beat tones), and command the ramp to start. The frequency and pitch display follows the ramp to three digit accuracy or to 1/8 hertz as it progresses. Microphone input - With volume control is provided for voiceover during a session. A balanced input amplifier with 1% resistors for noise cancellation accepts dynamic mikes, or electret mikes with their own power source, with 1/8 inch mono connectors. Microphone input with volume control is provided for voiceover during a session. A balanced input amplifier with 1% resistors for noise cancellation accepts dynamic mikes, or electret mikes with their own power source, with 1/8 inch mono connectors. Battery saving Automatic shutdown with user disable is provided. Gentle on/gentle off - Sessions start with a gradual volume and intensity ramp up to selected levels, and end with a gentle ramp down to off. Personal Preference Program setting capability. Sine wave sound with pitch ramping. Programming capability, full user programming capability from a PC computer. Thumbwheel controls, the system provides convenient thumbwheel potentiometer control of sound volume and light intensity, the same volume and intensity for each of the two users. New glasses drive circuit - Provides positive control over the current through the glasses, four circuits for the right and left sides for the two pairs of glasses, with 1% resistors for current matching. The Nova Pro 100 glasses polarity is "CG" (for common ground). Sessions - Sessions are organized in 8 categories: relax, meditate, sleep, learn, energize, visualize, entertain and special. Sessions are selected by selecting a category then a session within the category (so you don't have to wade through 100 sessions every time). In any category, the selection process proceeds through the built-in sessions, then through any downloaded sessions in that category. Download Capability - Downloaded sessions are given a category at download time, a single download can be 1 to 25 sessions in any one category. The downloaded session index is automatically reorganized to keep the sessions sorted in the intended categories, no matter what the order of download. Audiostrobe Compatible - Signals are recorded on a music CD at a high, inaudible frequency, to control the lights in a light/sound system. An AudioStrobe decoder detects these signals and uses them to drive the lights of a light/sound system, absolutely in sync with the music. AudioStrobe CDs are available from Tools for Exploration (1-800-456-9887) and other sources. 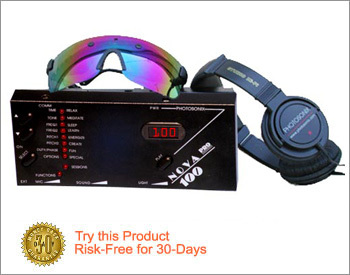 Just connect your CD player to the external input of the Nova Pro 100, and play the CD, with your headphones and glasses connected to the Nova Pro 100 normally, for an amazing AudioStrobe experience. For best results, do this while no session is running on the Nova Pro 100. There are 7 sound tones, utilizing the two frequencies F1 and F2 and pitches P1 and P2. PFr, pulsed frequency. Pitch P1 is pulsed at frequency F1. The pulsed tones provide a beep beep sound at the selected frequency F1 while the lights are blinking at the F1 rate. PSu, pulsed surf. A surf sound is pulsed at frequency F1. PCh, a pulsed chord with controllable chord separation from a minor third to a full octave. bb, binaural beats sends different pitches to two ears (pitch P1 to the left ear, Pitch P1 plus frequency F1 to the right ear) and the sound source direction detection mechanism in your auditory system picks up the difference frequency F1, while the lights blink at the F1 rate. bbS, binaural beats with surf, a soothing surf sound is the background for binaural beats. dbb, in dual binaural beats there are four tone generators running at once, the left ear receives pitches P1 and P2 mixed together, the right ear receives pitch (P1+F1) mixed with pitch (P2+F2). This gives two binaural beat ranges at the same time, and provides for monaural beat possibilities. New: dSb, dual monaural beats, Monaural beats occur when two closely spaced pitches are mixed in the same ear, beats are heard at the difference of the pitches. The dual monaural beat tone, new and unique to the Nova Pro 100 , sends P1 and P1+F1 to the left ear, creating monaural beats at F1, and P2 and P2+F2 to the right ear, creating monaural beats at F2. In addition, the left eye lights blink at the F1 rate, the right eye lights at the F2 rate, for a true dual stimulation frequency experience. The Nova Pro feature of providing a constant voltage charging circuit to protect the battery is continued on the Nova Pro 100. The AC adapter can be connected permanently without damaging the battery. The AC adapter input is protected against voltage reversal (if an adapter with negative tip is connected accidentally), and against a short time accidental connection of a higher voltage adapter up to 26 volts. A 9 volt AC Adapter with 300 milliampers of current capacity, positive inside 2.1 mm connector is provided. A 2.5 mm connector will also work, and a higher current rating is OK. Higher voltage adapters connected to the Nova Pro 100 for a long time however, will overheat the input regulator and may eventually burn it out. What you get: System unit, 1 pair of stimulation glasses, 1 pair of Pro headphones, AC adapter, computer cable, free Light/Sound Designer software download, Light/Sound Librarian software and additional session libraries to download from this web site, stereo cord, manual, packaged in a roomy shoulder strap carrying bag, with four fitted compartments that keep all items separate with plenty of room to add glasses and headphones in a convenient way. 30 day money back guarantee*, 1 year warranty.